That moment when it's too late Chris emphasizes, "NOT." 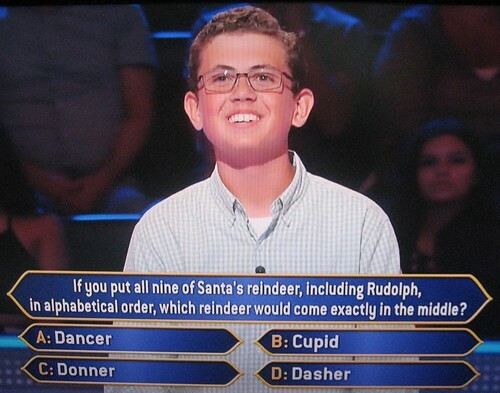 Could anyone tell me the name of the contestants or the original air date of the episode that ran on Thursday Dec. 29? I saw the ep while waiting at the dentist and there was a question I wanted to look at again, but I can't remember what it was. When American astronauts call Earth from the International Space Station, their phone number shows up as area code 281, the same as what U.S. city? Contestant was David Jackson, episode aired in the second slot on September 14, 2017. Fellow frustrated aspirants like myself will be gratified to know WWTBAM has been renewed for the 2018-2019 season. The linked article seems to assume that taping will continue to be in Las Vegas. Which is good for me, because from Chicago, air fares are just as good to LAS as to just about anywhere else. 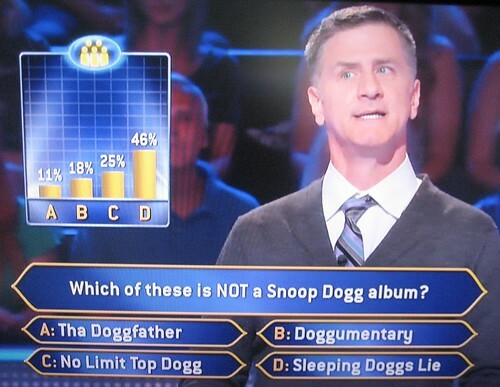 The audience and the host reacted in knowing Steve did not look like the typical Snoop fan. Steve had all lifelines available the audience gave him stairs. 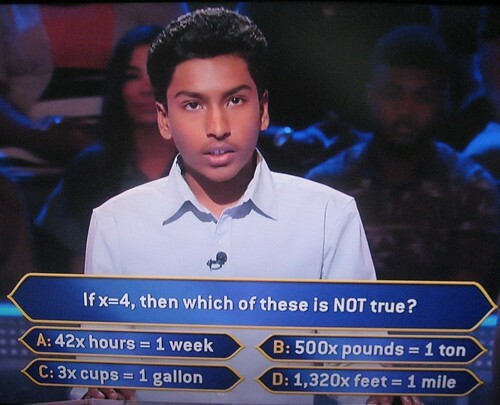 Not all contestants would take that margin on the audience polling, but Steve did and saw the $30,000 question. It was lifeline time again with his nephew. They went for C:Deepest gorges. 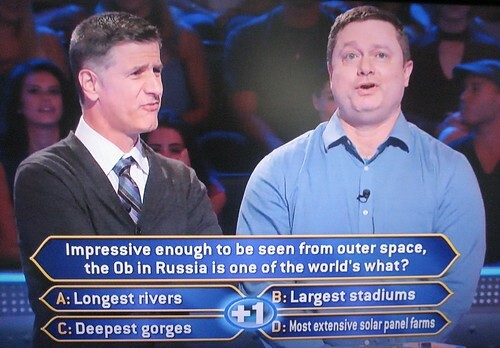 The correct answer was A: Longest rivers, so Steve left with $5,000 and the 50:50 unused. 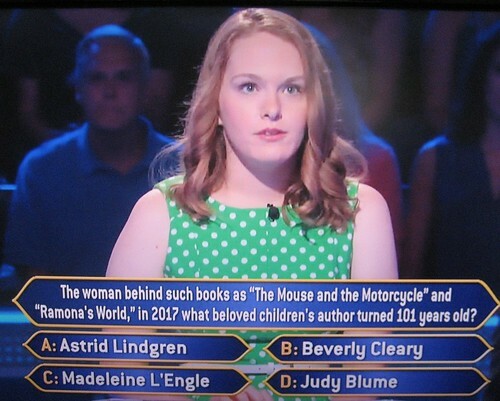 The ATA gave her 62% for the correct (Judy Blume was 29%) answer, Beverly Cleary. Kat will return tomorrow to see the $7,000 question and her +1 & 50:50 remaining. You and me Buddy. Next year in Vegas. She used the 50:50 and it left the diamond necklace & the fur coat. Kat locked in fur coat. Kat locked in Fire a shot in the Civil War. 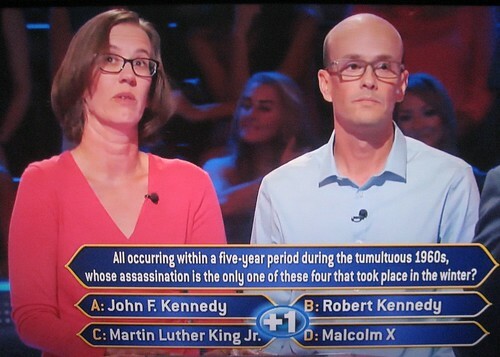 She used her +1 husband and the 50:50 on this $30,000 question. The 50:50 left Robert Kennedy & Malcolm X.
Amy and her husband went for Malcolm X in thinking Robert Kennedy was campaigning and in the 1960s that did not go on year-round, so not winter. 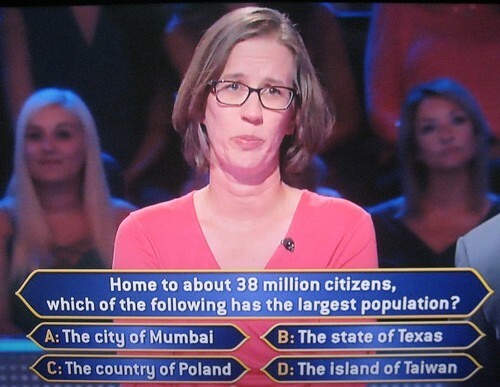 Amy strongly considered Texas thinking its population was 30+ million. She decided to walk with $30,000. The correct answer was The country of Poland with 37.95 million. There was a promo for next week with celebrities: Penn & Teller, Robin Leach, Cindy Williams & Wayne Newton. 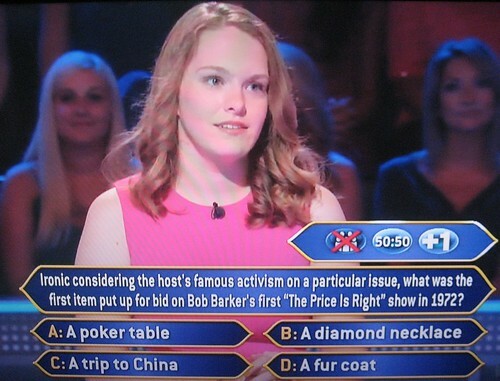 TPiR: Bob Barker hosted at that time, and eventually would sign off his shows with the request that we spay and neuter our pets, so the prize with the dead animal would be the ironic one. April 1860: Civil War was the first thing to pop out at me, but on further reflection, I realized that although the war did start in April, that wasn't until the following year. The only choice where the weight seemed relevant was riding on the Pony Express. 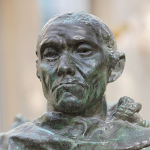 Winter assassination: I first thought JFK, but November isn't winter, despite my opinion that seasons begin before their respective solstices or equinoxes. So JFK was November, RFK was June, and MLK was April. I didn't know when Malcolm X was killed, but the other three were ruled out. 38 Million population: I thought California's population might be close to that, and it's got more than any other state, so that ruled out Texas. As for cities, I was sure Seoul has the most with some tens of millions [edit: I was wrong; Seoul's #3 among urban populations, behind Tokyo and Jakarta], and I didn't think Mumbai would be all that close behind. That left the two countries, and I went for the one that felt larger to me, which was Poland. But that's me lucking out from home; I only felt reasonably sure about eliminating Texas. Ashley Star was picked from the audience to play one question for $1,000 since there was not enough time to start play with a regular contestant. Instantly knew both Calvin Coolidge and Polo. On the Calvin Coolidge question, when the audience percentages showed up, said to myself, "Uh Oh". Calvin Coolidge president from 1923-1929. Easy question for me, very difficult for many others. I'm an A rundler, and had to look up this answer. I don't think this is that well-known anymore. 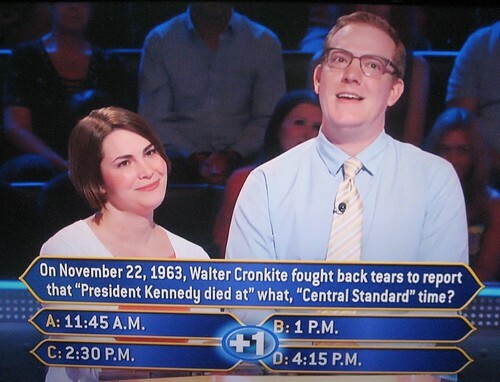 The question didn't say it was the president at the time. But Harding was dead, and Hoover and FDR had yet to be elected. I did very briefly wonder if it was a trick question because Hoover was Secretary of Commerce at the time, but figured the writers wouldn't be that cruel. Henry went with the audience. 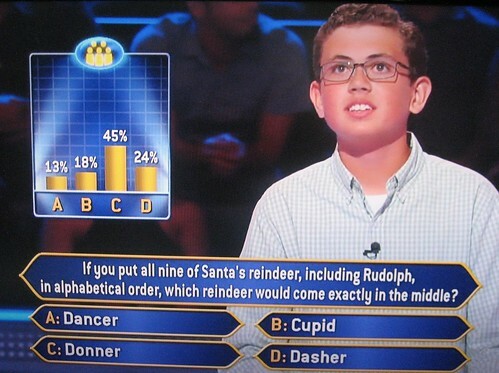 Blitzen, Comet, Cupid, Dancer, Dasher, Donner (Milionaire don't play that Donder reindeer game), Prancer, Rudolph, Vixen. He left with $5,000 and his +1, 50:50 and Cut unused. This is the third Whiz Kids Week of the season so far? 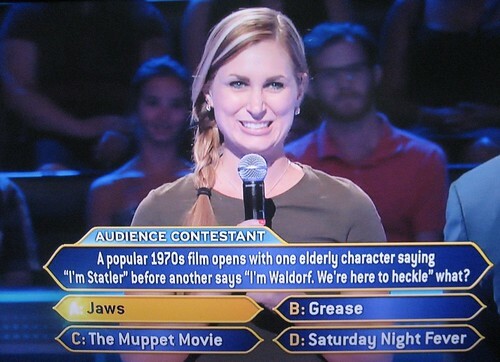 You shouldn't really use the Ask the Audience lifeline so soon on a question that takes time to think about. I Really hoped that Henry would get farther. I got every single question right in today's episode. The +1 was her husband and between them they felt Cronkite had not announced a time with the odd number times having :15 or :45. They considered guessing although with no lifelines remaining they agreed on walking with $30,000. 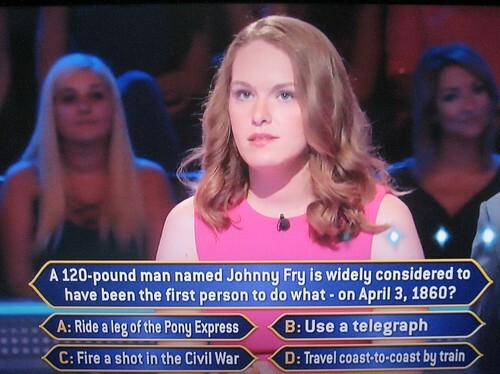 The correct answer was B: 1:00 P.M. and the one Amelia would have guessed. 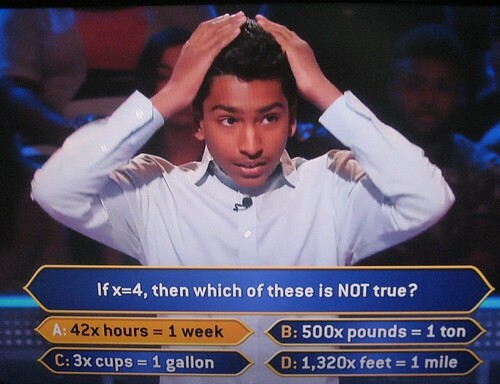 I thought it was a great $50,000 question as some would know it, some would guess it, some would use lifelines and many would be in a tough spot even if they had seen/heard the clip many times over the years. I was in the know it category as I have seen/read enough things over the years. Is it familiar for the song that goes with it? It made laugh with fond memories. Of course I'm just a B rundler. I have no idea who those muppets are. I think that for people under 40, muppets who weren't prominently on Sesame Street are really obscure. Last edited by Volante on Thu Feb 15, 2018 11:06 am, edited 1 time in total. I'm 23, not good at pop culture, and I knew it immediately. Even if you don't know it, you only have to guess which movie would start out self-referentially. There's one title that lends itself to that. 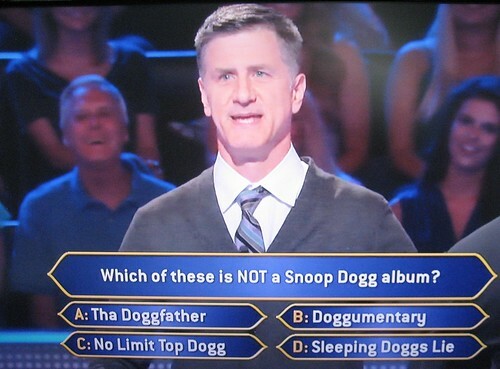 The contestant picked the title least likely. It's a good week for former J! contestants on Millionaire - Guy Jordan, Sara Lehmann, and Keith Williams are on. I'd post the preview, but it has a pretty big spoiler.